You care about this farmer. To you, this is not the generic statistical average of those who check the occupation box marked “farmer.” No, this is someone whose name you know, whose opinion you care about, and whose joy you wish to spark. This is someone who means something to you. 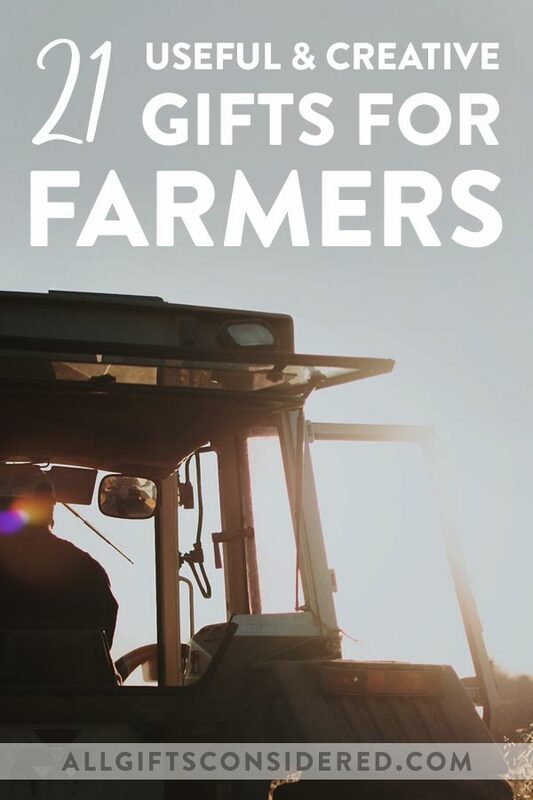 So our 21 farmer gift ideas do not aim to give you a list of stuff. Instead, we will help you explore the quintessence of farmerness, revealing the unexplored depths within the soft-spoken and hard-working farmer in your life. We’ll scale the joyous heights of farmery and plumb the solitary depths of the daily barnyard grind. We’ll peel back the layers of gruff exteriors and ritualistic habits of daily chores to help you better understand the psychological makeup of the modern American farmer. And we’ll do all this by looking at an unexpected source of insight and inspiration: gift for farmers. You see, what a person wants is often directly tied to their felt needs. What they appreciate receiving tells us about the type of affection for which they yearn. Thus, by examining the gifts that farmers love to receive, we can learn much about their deeper inner workings. Or maybe we can just try to find some creative and useful gifts for farmers. Back in reality, you’re looking for some gift giving inspiration, and we’re here to provide it. But, tongue-in-cheek pretensions aside, we also really do believe that if you care about someone and think deeply about the sorts of gifts they would like to receive, you can come to know them a bit better and deepen your relationship as you seek out, find, and give creative and personal gifts. 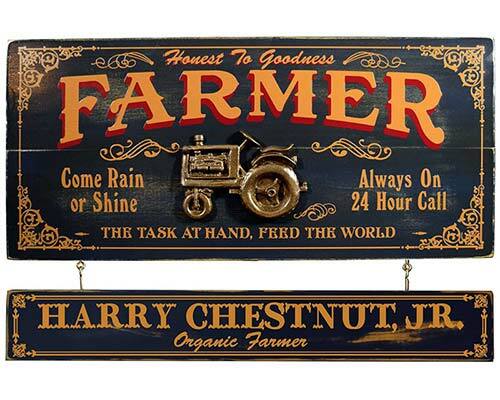 Made in the USA, this vintage-style Farmer plaque boasts an old-fashioned sense of style and charm. This wooden sign is crafted from furniture-grade wood, painted with poly-arch lithographic technology and then distressed by hand. It has a hand-carved and painted 3D tractor applique as well. You can add a personalized name board to hang from the top plaque. We’ll customize this with the farmer’s name, making it the perfect personalized gift. Personalized tumblers make a wonderful, useful, and personalized gift for a farmer. These durable double-walled and vacuum-sealed mugs keep beverages hot (or cold) for hours on end, meaning that your farmer’s coffee with stay hot and never get mixed up with anyone else’s brew. This “Best. Farmer. 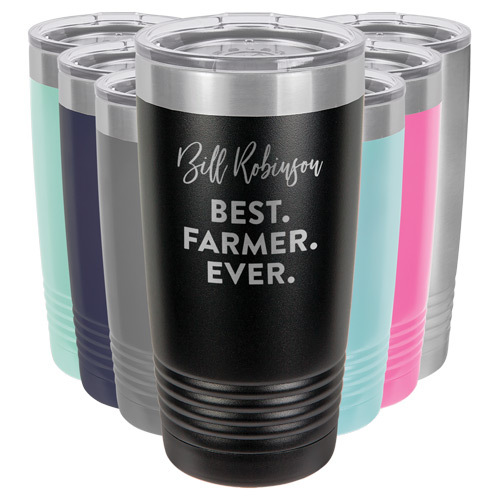 Ever.” design includes customization of your farmer’s name and your choice of four sizes in seven attractive colors and two styles (traditional mug or “stemless wine glass”). Free personalization and bulk discounts are also available! These durable and portable speakers can hook up to any phone, play the radio, and travel along with the farmer in your life wherever they may be. 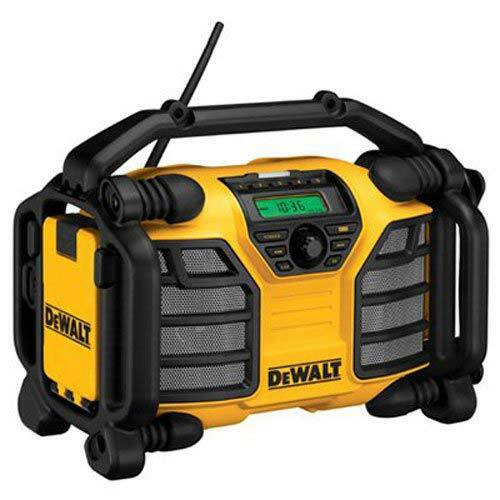 Plug in to a traditional outlet or go wireless with standard DeWalt 12v rechargeable battery packs, this is a great gift for any farmer who loves to listen to the radio throughout the day. How about an authentic oak aging barrel for the bourbon connoisseur? 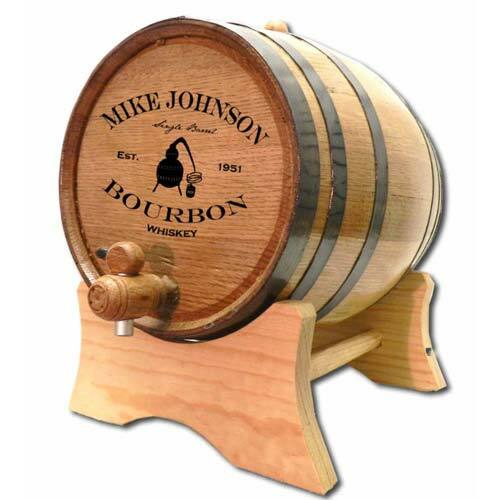 These barrels come in a variety of small tabletop sizes and include custom laser engraving of name and more. This particular design features an old copper still as the centerpiece for the design, and is personalized with your farmer friend’s name and year established. The barrel also includes a stand, spigot, bung, and storing tablets: everything they need (except the alcohol) to start aging and flavoring spirits at home. How about a fun and fresh farm t-shirt! 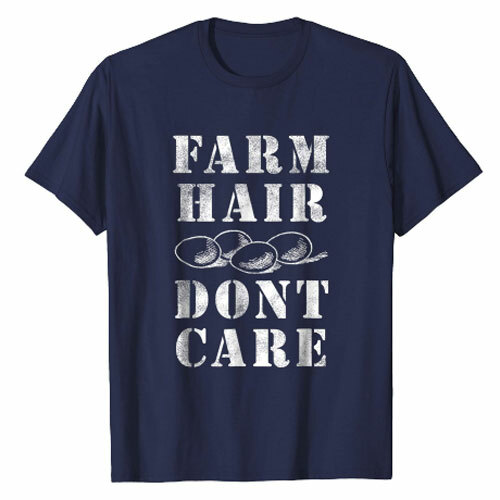 This one features some newly laid eggs and stenciled text which reads, “Farm Hair Don’t Care.” Because it don’t. 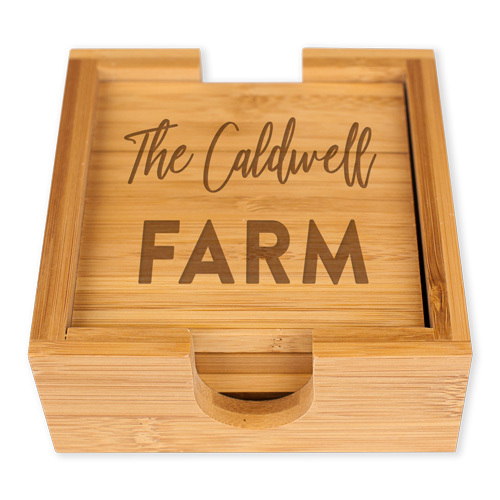 This beautiful farmer gift idea is a genuine walnut wood keepsake box with hinged glass lid, tractor etching, and personalized name plate. A gorgeous way to show your love and appreciation, ideal as a retirement gift. 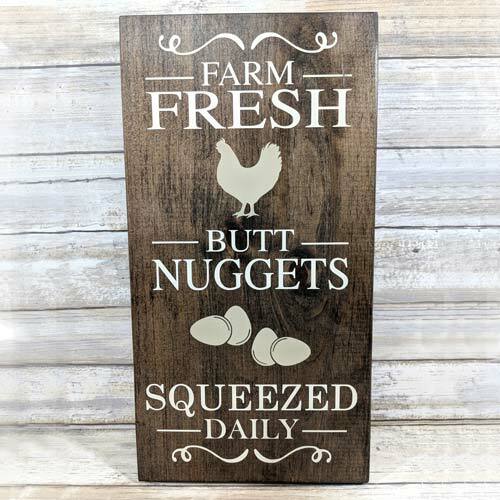 A Northwest Gifts Original, we craft this personalized farmer sign from solid wood and custom engrave it to order for the farmer in your life. You can personalize any aspect of the plaque, from the top line all the way down. We offer the sign in two sizes (18×24 and 12×16) and with the option to add a hanging name board for additional customization. Additional hanging name boards are available upon request. 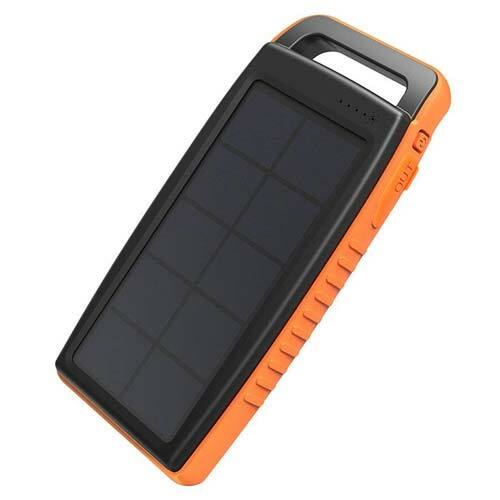 Any farmer who spends all day out in the fields, barn, workshop, or tractor will appreciate a thoughtful gift like this portable solar powered phone charger. With a durable design that is shockproof, waterproof, and dustproof, this charger gets recharged whenever the sun is out and can charge your top-of-the-line smartphone 3-5 times (depending on the model) on a single charge. A truly useful gift idea for the busy life of the contemporary farmer! 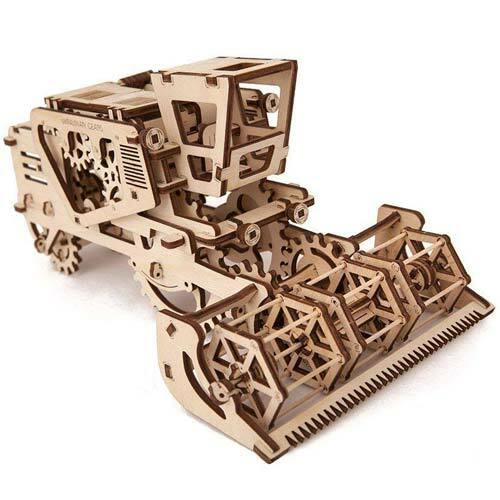 From UGEARS comes this gorgeous and exciting wooden combine tractor model that really works. The combine harvester is a 1:35 scale model with 154 wooden pieces to assemble into a working tabletop version of the classic farm equipment. The perfect gift idea for a farmer who loves to fiddle with things, take them apart, and put them back together. 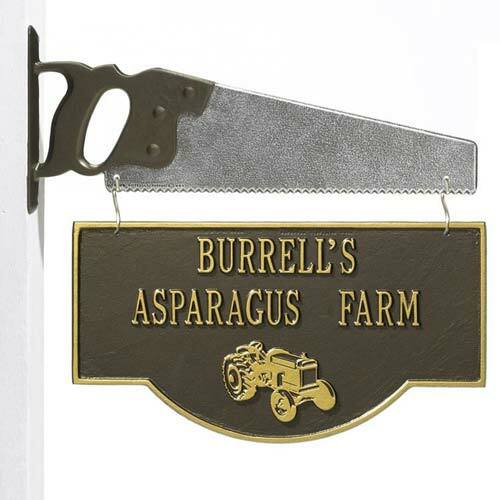 This personalized metal shop sign is perfect for the farmer’s barn or tractor shop. It can hang from a beam or you can get the saw hanger (shown above) or a flame hanger, which is also pretty cool. The plaque itself includes personalization and hangers, and is suitable for indoor or outdoor display, ready for any weather. The perfect gift for a farmer who is out early on the tractor, braving the cold pre-dawn weather. 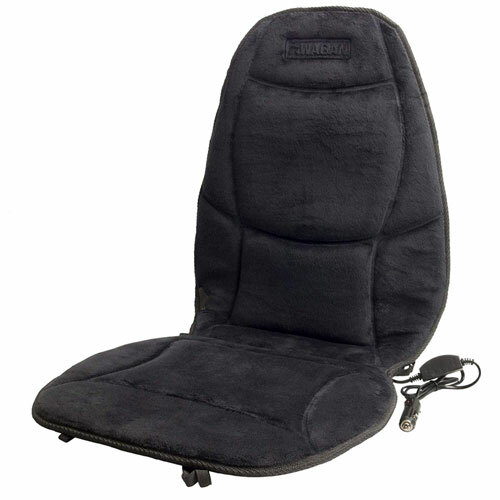 This heated seat cover works for the truck, tractor, or any other farm equipment. Plugs into any 12v outlet (think cigarette lighter outlet). While a heated seat cushion may not exactly be a heartwarming gift idea, it will certainly warm other regions! Another Northwest Gifts Original, we craft this wall-mounted wooden bottle opener in our Oregon shop and custom engrave it to order just for you. 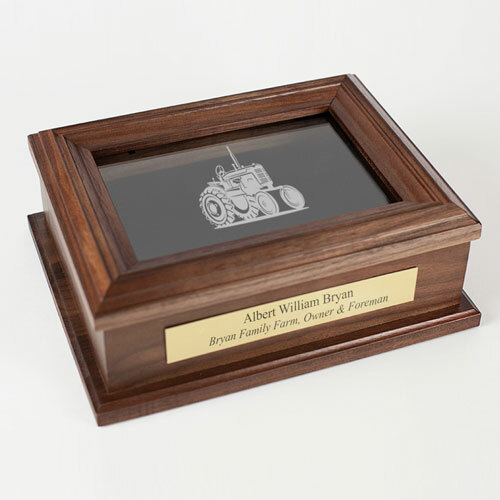 The front surface boasts a laser etched tractor and up to two lines of personalized text. 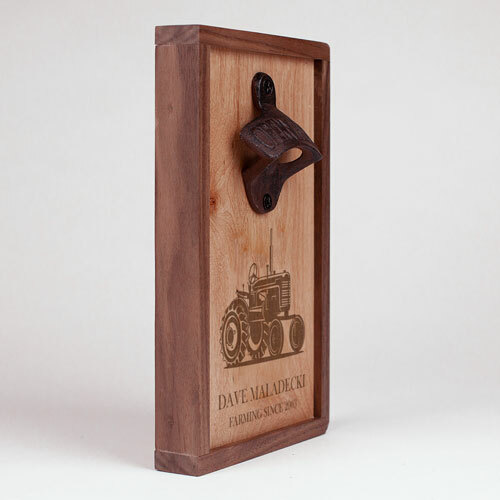 This bottle opener is a great gift for a farmer who loves to kick back after a long day of work and crack open a brew. At Christmas, the only parties worth going to are ugly Christmas sweater parties. 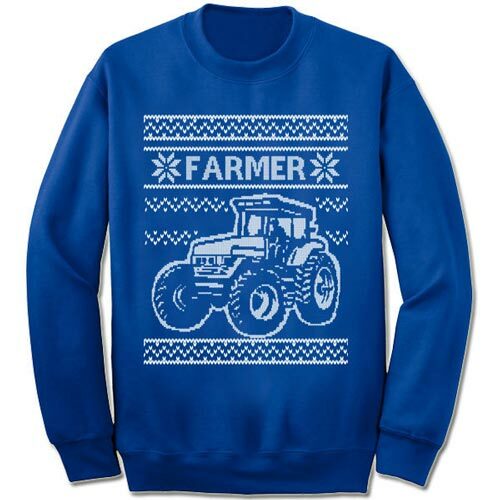 And if you are going to go party up at an ugly Christmas sweater party, your farmer will need a tractor-themed ugly Christmas sweater. So here it is. The personalized touch always adds so much to a gift. Your recipient will appreciate that you didn’t just go out and buy something off the shelf somewhere, but you took the time to make it special, and just for them. This set of four personalized bamboo wood coasters includes custom laser etching and a matching bamboo holder. 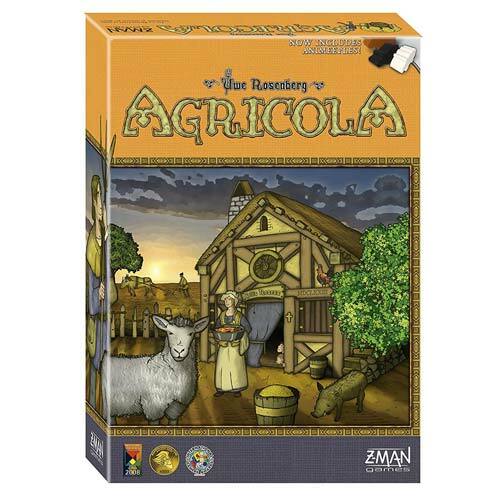 One of my favorite board games, Agricola conveys a sense of the rhythm of life on the farm through the passing of the seasons, planting, harvesting, breeding livestock, and feeding your family. If the farmer in your life enjoys strategy board games like Settlers of Catan, this will be a great hit. 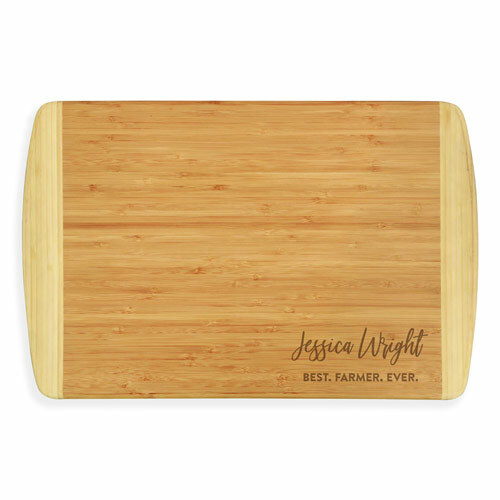 Sometimes a personalized accessory, like this gorgeous bamboo wood cutting board, says everything you want in giving your gift. Our boards are made from sustainable bamboo, affordably priced, and include personalization. Choose the name and text of your choice to honor the farmer in your life. 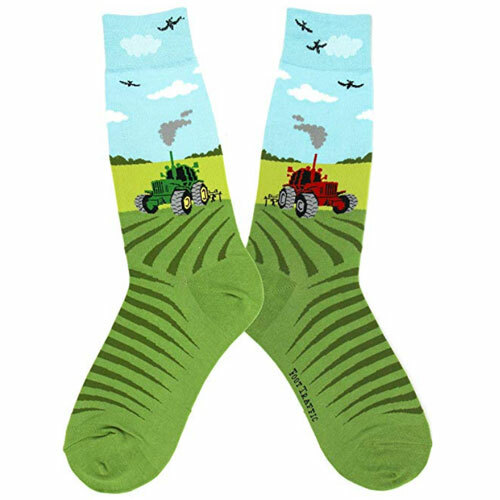 These fun socks are the perfect gift for a farmer. Each sock has a tractor (one red, one green) racing away over the furrowed fields of the farm. A great stocking stuffer! 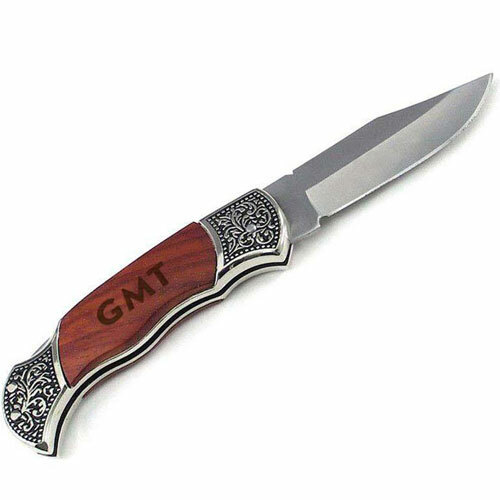 Our rosewood handle pocket knife features a custom engraved wooden handle and 3″ stainless steel blade. While the farmer in your life most likely has some sort of knife, they may not have a personalized heirloom gift of such fine quality. A thoughtful and useful gift for a farmer. 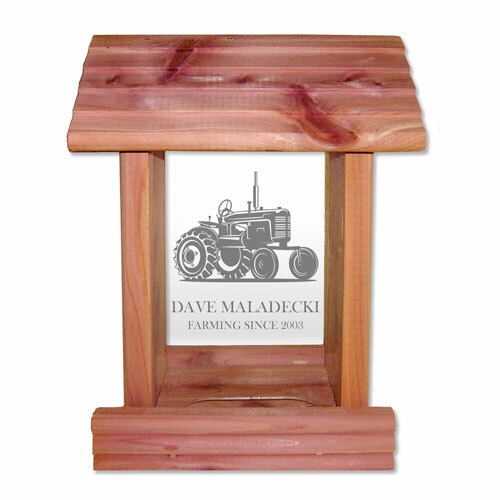 Get your farmer a personalized cedar wood bird feeder. They’ll love it, trust us! We’ve been customizing these bird feeders for many years, and it is a well-loved and appreciated gift. Unlike so many other gifts which end up in junk drawers or sit, unused, on a shelf somewhere, this bird feeder goes out of doors. Filled with bird seed, it will attract and feed birds for years to come, adding more life and vitality to your farmland. 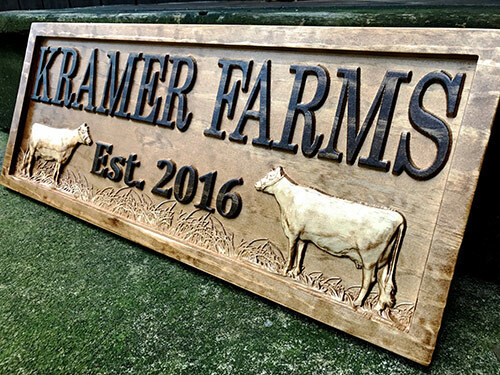 This personalized farmhouse sign features carvings of cows and 3-dimensional wood lettering. The cow images are carved below the name and on either side of the custom “established” year. 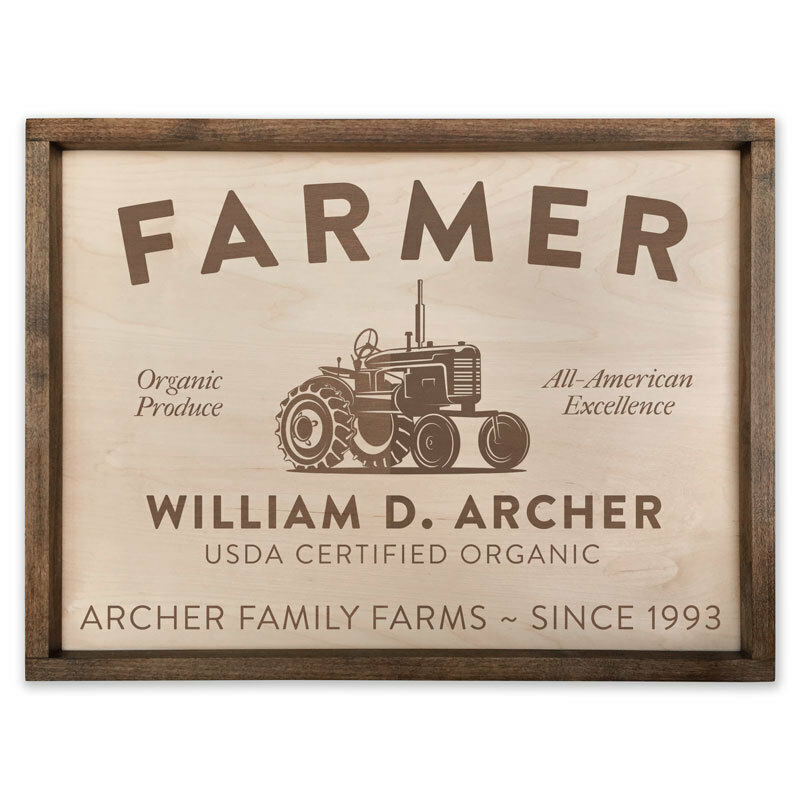 With a sturdy wood frame, contrasting lettering, and grassy accent carvings, this is a stunning family name sign and the perfect farmer gift. So many great gifts! There are a lot of great ideas in this post, so be sure to bookmark or Pin it to your Pinterest boards to save for later. 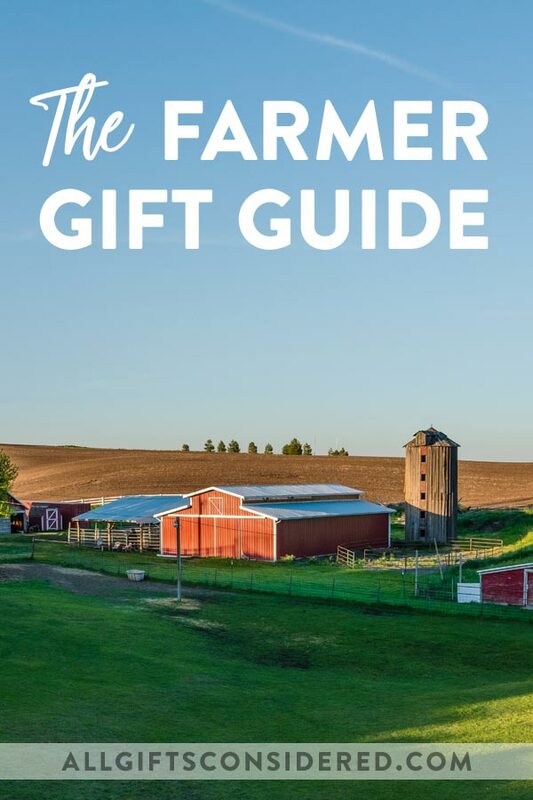 If you need further farmer gift ideas, check out Northwest Gifts, where you’ll find our Farmer Gift Guide plus plenty of unique and creative personalized gifts for any and all comers.